URGENT: Remember Lehman Brothers? -- By James M. Carrillo - We are on the verge of a major world event. The current situation with Europe's banking giant Deutsche Bank is not something to be taken lightly. I have had a close eye on Deutsche Bank's stock over the past year, which now appears to be unraveling rapidly. The Secret Saudi-Dollar Connection -- By Craig R. Smith and Lowell Ponte- President Donald Trump was greeted and treated like a wise and welcome world leader and ally in Saudi Arabia. But the media said almost nothing of the secret connections that for 46 years have kept our two nations linked in a special, mutually-dependent relationship. Don’t Sit and Watch, Be Prepared! -- By James M. Carrillo - While growth and making America great again are obviously the goals of all working Americans, the unwinding of massive debt, troubled banks and over a decade of bad policies will prove difficult and may come with severe pain for unprepared citizens - especially retiring baby boomers. The Trump Effect Upon Tangible Assets -- by David Bradshaw, Idea Factory Press - With the dollar hitting 2003 highs and the stock market enjoying the "Trump effect" here are a few things to keep in mind when considering asset safety and growth in 2017. FROM THE DESK OF THE CHAIRMAN -- by Craig Smith-- It was debt that caused the 2008 crisis. Today we have even more debt than we did in 2008. There are many ways to deal with excessive, unmanageable debt. Preparation is Preservation: A Reality Check -- By Dean Heskin - You don’t have to flip too many channels or look at Facebook for very long to realize we’re a divided nation. If volatility had a colloquial definition, it would likely include a divisive presidential election between two polarizing candidates who are miles apart on every issue. Paper is Poverty! -- By Craig R. Smith - Thomas Jefferson once said, "Paper is poverty. It is only the ghost of money, and not money itself." Jefferson was a man of many accomplishments among them Founding Father, author of the Declaration of Independence, Vice-President, President and an early proponent of honest money. Why the 2016 Election is Economically Volatile -- By Dean Heskin - Presidential elections by their very nature are volatile. They can be contentious and unpredictable. Despite the projection of the pollsters or the predictions of the pundits, no one can really say for certain who will prevail on Election Day. Brexit Money-Quake -- By Lowell Ponte - The world's ruling elite expected the June 23, 2016 United Kingdom Brexit vote to fail. Investors who believed these elitists were shocked when this referendum won by 52-48 percent, launching a countdown to separation between the UK and European Union. Will the Brexit Unleash a Global Meltdown? -- By Lowell Ponte - On June 23, the British people voted in a national referendum to declare their independence from the European Union. The ruling political establishment, right and left, had joined to crush this populist uprising with a campaign of fear and authority. If Jobs are Back and the Dollar is Strong … Why are Billionaires Buying Gold? -- By Dean Heskin - The government now tells us we’re enjoying a 5% unemployment rate with some officials even suggesting we are now at full employment. The national unemployment rate is indeed down over 50% from highs set during the Great Recession back in the Fall of 2009. MAJOR LONG-TERM REVERSAL TRIGGERED IN GOLD AND U.S. DOLLAR -- By James M. Carrillo - On March 31, the U.S. dollar triggered and re-established its long term bear market trend, signaling a major long term sell-off. The Great Regression: The Crash of 2016 -- By Dean Heskin, CEO, Swiss America - Is the US economy regressing? We are in the midst of the slowest and most lackluster economic recovery since the end of World War II, and it appears to be weakening. The Stealth Bear Market Cycle. Why it could Wreak Havoc with your Portfolio. -- So what is all this talk about a “Stealth Bear” market and what does it mean for your investments? A traditional Bear Market is characterized by falling stock prices, a strong selling environment, and general market pessimism. Disclaimer: News and commentaries posted at Swiss America does not necessarily express the opinions of Swiss America nor of its personnel. 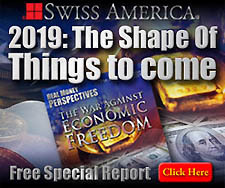 Swiss America attempts to post only credible news and opinions, however we do not take responsibility for the accuracy of external content nor should it be construed as an endorsement.